A scene from Akira. Image: screen grab from YouTube, via channel Goldeneye32X. 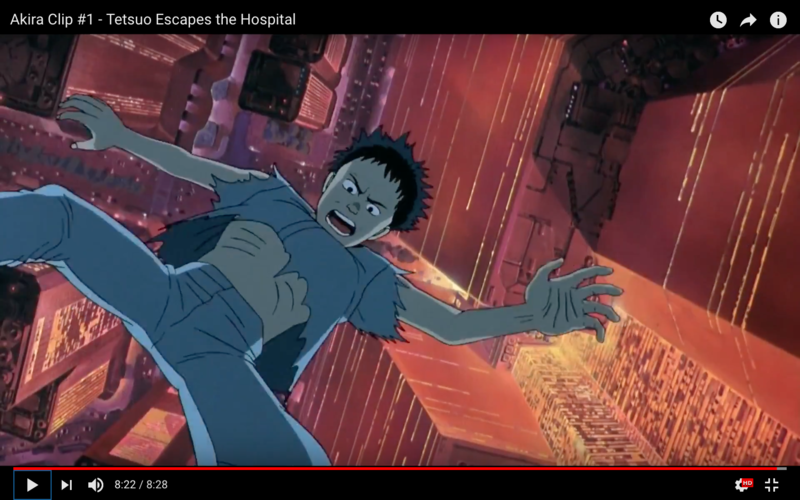 On July 16, 2018, netizens around the world marked the thirtieth anniversary of the release of Akira , a groundbreaking film that revolutionized  and influenced  how animation forever. To mark the occasion, fans from Japan and beyond shared their favorite scenes from the movie — and why, thirty years on, Akira remains so fascinating to so many people. Akira was written and directed by Otomo Katsuhiro , in 1988 already a legendary manga artist in Japan, and based on his popular manga series of the same name , which had been initially been published as a monthly serial starting in 1982. The story takes place in the year 2019 in a post-apocalyptic Neo-Tokyo, an authoritarian police state where protests are repressed, corruption runs rampant and the rule of law is nothing but a façade. Childhood friends Kaneda and Tetsuo lead a local biker gang when a motorcycle accident wakes in the latter powerful psionic abilities, testing their relationship and threatening the military complex that rules over them. As with so much of post-war Japanese pop culture, Akira's themes of destruction, hopelessness, and resilience echo the real-life events of 1945, when the United States dropped atomics on the Japanese cities of Hiroshima and Nagasaki , with the two attacks immediately killing at least 200,000 people. Both the manga series and the 1988 movie are cyberpunk tour-de-force that includes amphetamine-popping motorcycle punks, sophisticated military hardware, and transhumanism. In the movie, the explosive cataclysm  that gave rise to Neo-Tokyo took place on July 16, 1988. In the real world, the movie was also first released on this date, and this anniversary was celebrated around the world, including in Japan. That film, and the manga that inspired it, are set in the far-flung year of 2019, when Tokyo has been destroyed by a 新型爆弾 (shingata bakudan, new type of bomb) that started 第三次世界大戦 (Daisanji Sekai Taisen, World War III). Rebuilt as the dystopian ネオ東京 (Neo-Tokyo), the megalopolis is populated by corrupt politicians, revolutionaries, 超能力者 (chōnōryokusha, those with psychic powers) and teenage 暴走族 (bōsōzoku, motorcycle gangs). “Akira” was painted digitally — a revolutionary step at the time — on a PC with a 12 megahertz processor and a handmade heat diffuser that, Oliff wrote, “chugged like an old farm truck.” Initially, the colorist sent drafts to Otomo for approval, but eventually, the “Akira” creator told Oliff he trusted him with it completely. In an interesting cross-cultural moment, Epic’s colorized version was converted back into Japanese and released in Japan soon thereafter. A screentone  of a giant Testuo (the main antagonist in the manga series and in the animated film) in Shibuya (in Tokyo). I think I prefer Moiré pattern-technique  myself. For many people around the world, the story and themes of Akira continue to be thought-provoking. What I now grasp is that it was, and is, different in Japan. For the simple and very good reason that Japan was, and is – and we can only hope remains – the only nation to have actually experienced nuclear warfare. You can explore further commentary on Akira through the hashtags #アキラ , #Akira , #Akira30 , and #AKIRA_Animation_30th_Anniversary .